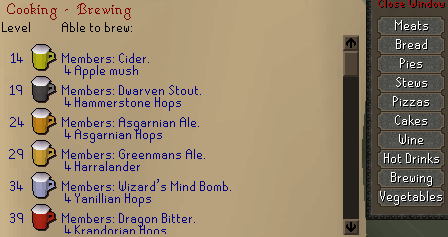 Brewing ales and ciders is another small part of RuneScape, just like Gnome Cooking. It was introduced along with the Farming skill, and when you brew, you can get both bad batches and mature batches. Keldagrim - above the bar. Port Phasmatys - below the inn. 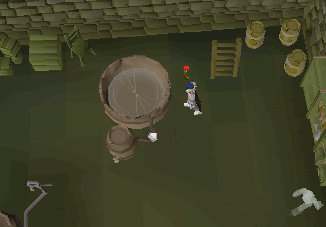 Note: The Port Phasmatys Vat seems to take longer to brew ales than the one in Keldagrim. Now you need to find out which ales you can make. To do this, just click on the cooking icon in your stats menu and select the "Brewing" tab. Fill the Vat in a Brewery with two buckets of water. Put two handfuls of Barley Malts (cook a Barley on a Range) in the Vat. Place your main ingredient in the Vat. Pour a potfull of Ale Yeast into the Vat. Note: You can add The Stuff into the vat after the Barley Malt to increase the chance of your ale being mature. This can be obtained As a prize from the Trouble Brewing Activity. In Port Phasmatys, the Ale Yeast will cost 5 Ectotokens per pot. In Keldagrim, it will cost you 25gp. To get the Ale Yeast, bring a pot and the payment to either of the guides in the Breweries (Blandebir in Keldagrim and Metarialus in Port Phasmatys) and ask if they have any spare Ale Yeast. Now just wait for your ale to mature. Unfortunately, just like Farming, it will take a long time to mature. So wait about 24 hours. After that, examine the vat and it should say it is ready. If it isn't matured, it will say that it is fermenting. When it has matured, turn the valve on the Fermentation Vat and the mixture will pour into the barrel. Just use your beer glasses on the barrel to fill them with the ale. Bring 16 Apples and four Buckets to the Vat. Crush the apples using the Cider Press. Fill four buckets with the apple-mush and pour them into the Vat. Then just pour a pot of Ale Yeast into the vat, and wait for it to mature. Again, Cider can take up to 24 hours to mature, so sit back and play some Castle Wars, another RuneScape activity, or get some fresh air outside in the "Real World." Sometimes your character will fail at brewing the different kinds of Ales, and it will become un-drinkable. The Vat will have Bad Ale in it, should the fermenting process fail. Simply turn the valve and choose the "Drain Barrel" option to remove the ale and start over. There are all sorts of brews that you can make, all of which increase your stats.